There have been 7 units sold in this building in the last 12 months. The last unit in this building sold on 3/22/2019. Click here to get the details of all closings in the last 12 months. 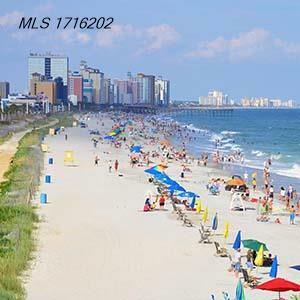 Oceans One is a popular oceanfront condo project centrally located on the south end of Myrtle Beach. Its contemporary architecture has made Oceans One a favorite of oceanfront real estate investors in the Myrtle Beach area. This 20-story high-rise condo offers one-, two- and three-bedroom units and is conveniently located a few blocks from the 2nd Avenue Pier, the Myrtle Beach Boardwalk and the Family Kingdom Amusement Park. Oceans One features indoor and outdoor water amenities, unobstructed views of the Atlantic Ocean through the floor-to-ceiling glass private balconies. In addition, each unit includes luxury upgrades like Jacuzzi tubs, designer furnishings and tile floors. And the kitchens feature granite counter tops and stainless steel appliances. Welcome to the official CENTURY 21 Strand Group website for Oceans One South Tower condominium sales.